Listen to your Intuition. I am a firm believer that your inner voice is always guiding you towards your highest good. Learning to heed those fleeting thoughts or small details that catch your attention does take practice. But as you get the hang of it, it will pay off. I recall early one Sunday morning I felt the need to just scan a press newswire. I learned about a company’s community initiative around a national observance, and I pitched an idea that Eat Soccer was able to execute for them. I had the pleasure of interviewing Qiana Martin. 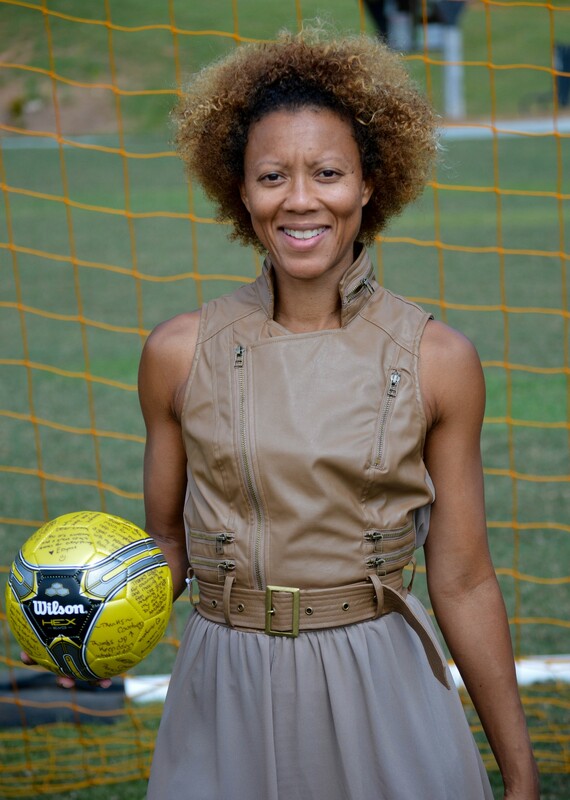 Qiana is an international athlete, global soccer ambassador and founder Eat Soccer. The TEDx speaker and former Fila model produces soccer lifestyle content, experiences and data tools to connect global brands with passionate fans, one of her most notable projects being a clip for Pizza Hut’s 2013 Big Game Super Bowl commercial. Her efforts on and off the field have garnered coverage in Forbes, Inc. Huffington Post, Fast Company, Men’s Journal, US News + World Report, Our World with Black Enterprise and Yahoo Eurosport. I owe where I am today to all of the days that I used to run and daydream about playing soccer. My Mama allowed me to participate in the sport when I was younger, and as I grew older, those opportunities were harder to come by. Once I relocated to Los Angeles, I expressed my dream to a mentor who believed that it was never too late to pursue a goal. He bought me a pair of cleats, and the following day, I started playing soccer in the local park with groups of Latin American, African and Caribbean guys. My passion grew even more, and I bought a book on Brazilian soccer principals, with the determination that I would find a way to go play soccer in the land of Pele. Bridging the gap between embarking on my dream and where I am now was a repeated exercise in facing three challenges. First, I had to change my perception of what it meant to create my own path. Second, I had to be open to the unique ways in which opportunities came to me. Lastly, I had to develop a confidence in the journey that I was on despite what others thought of it. When times were tough, I relied on my support circle. If I questioned my progress, I looked to a benchmark tracking document that I created to outline every contact, connection, opportunity and experience that had come my way. It provided me with an objective perspective that I was moving forward. Additionally, I sought out countless success stories of trailblazers in a wide variety of fields. Learning how they overcame their obstacles gave me hope that my leap of faith wasn’t in vain. When I reflect on my tenacity to stay the course of my journey, I know my personal recipe for grit is the result of four ingredients- a great vision, resilience in bouncing back from perceived setbacks, using intuition when taking risks and employing toughness to hang on just a little bit longer. My personal definition of grit has allowed me to accomplish bucket list benchmarks in unexpected and fun ways. I have the opportunity to experience soccer in many parts of the world, work with a number of global brands on soccer inspired projects and influence others through my passion for the sport. If you’re looking to develop grit, here are my five suggestions. 1. Be passionate about a Great Vision that is unique to You. One of my role models is George Washington Carver, and I always admired how he expressed his passion for the peanut and later the soybean. Taking a page of out of his book, I determined that I would find all of the ways that I can make soccer a useful tool in the lives of others. 2. Show Resilience. I used a document to track every interaction, coincidence, connection and opportunity that I’ve received related to my goal. It allowed me to see my forward momentum even on the days when I felt that I was experiencing stagnation. 3. Listen to your Intuition. I am a firm believer that your inner voice is always guiding you towards your highest good. Learning to heed those fleeting thoughts or small details that catch your attention does take practice. But as you get the hang of it, it will pay off. I recall early one Sunday morning I felt the need to just scan a press newswire. I learned about a company’s community initiative around a national observance, and I pitched an idea that Eat Soccer was able to execute for them. 4. Get Tough. Everyone isn’t going to understand or support your leaps of faith, and you shouldn’t expect them to. To save up money for my soccer dream, I worked in Attorney Hiring for a nationally recognized law firm. Unbeknownst to my co-workers, I was playing street soccer outside of the office, and on one Saturday morning, I tore my ACL. When I returned to work the following week on crutches, a co-worker asked in a snarky tone, “Was it worth it?” I could’ve felt bad, but I responded, “Yes, it was worth it.” I had the confidence to know that this was a minor hiccup, and this perceived “setback” set up my perfect Brazilian soccer experience 18 months later. 5. Learn to be Flexible. My Brazilian soccer opportunity came courtesy of the author of a book. A bucket list goal of showcasing soccer in a Super Bowl commercial was the result of my mama hearing a radio advertisement in our hometown. Another campaign feature came to me via Twitter. The journey to greatness is rarely straightforward, and the more you’re willing to open your eyes to the full scope of opportunities around you, the faster you can achieve the goals you’ve set. My Mama has been a huge supporter of my dreams. One of the most invaluable ways that she has helped me has been with her daily calls. Whether it’s by voice or FaceTime, our conversations begin with her sharing a rundown of news stories that she believes can be help for me. They can be new developments in different industries, something soccer related, brand partnership announcements or her hunches that I need to reach out to particular writers or editors. Although my Mama doesn’t have a background in business, she has a priceless knack for relaying timely information and encouraging me with uplifting success stories, bible verses and fortuitous horoscopes. Her tips helped me snag a preliminary interview with an editor for O Magazine and an opportunity to produce a segment of Pizza Hut’s 2013 Super Bowl commercial. Loving thy neighbor, being a Good Samaritan and paying it forward were principles that I learned at a very young age. Therefore, at every stage of my journey, I’ve made a point to use my talents in helping others use soccer as a vehicle to global citizenship. To provide minority Atlanta girls with access to top notch sports and leadership training, I’ve volunteered my services to Sporty Girls, Inc. For FIFA World Cup 2014, I worked with students from Georgia Institute of Technology to create pilot episodes of Huddle Up, a digital series that introduces S.T.E.M. principles to elementary students against the backdrop of the teams participating in the global tournament. And to help bring diverse soccer stories to audiences, I’ve supported and promoted documentaries such as the Anderson Monarchs. Recently, Eat Soccer was selected to partner with the World Jewish Congress and Chelsea Football Club on their global initiative to combat the widespread phenomenon of anti-Semitism and racism in sports. Our company will be producing a couple of experiential events that will bring diverse fans of New York City’s soccer community together to reinforce inter-faith and intercommunal interactions. I would suggest that executives encourage their employees to find a connection between a unique aspect of their background and your company’s product or service. Their diverse perspectives are sure to generate ideas, approaches and solutions that you may have overlooked and remain untapped. Moreover, it will help employees to realize the value of their thoughts, ideas and experiences, while simultaneously giving them a boost to explore what else they have to offer your company. In my TEDx talk, I shared my big idea that people should embrace the universal language of soccer. I believe that the sport can serve as a vehicle for people of all backgrounds in the U.S. to become global citizens. It is my belief that when people share a common bond that it can serve as a starting point from which they can learn about and appreciate each other’s differences. “Life happens in five seconds,” is a personal mantra that I’ve kept close to my heart for quite some time. It stemmed from experiences that my BFF and I would go through where we would receive some less-than-ideal news; and then, after the shock of it all subsided, realize that a solution or change in status was possible. Over the years, I’ve found that, whether on the soccer field, in business or other aspects of life, our perceived setbacks are not final. We shouldn’t become hung up on them because if we do, we may miss out on our next big play. Sometimes, we don’t have all of the information or the problem will serve as the catalyst for our next big goal. As a result, I’ve learned that it’s important to take a pause, change my outlook and prepare for my next best step. Readers can follow me on social media at qianarana on Twitter or qiana_soccer on Instagram.